SEBASTIAN – Sebastian residents who travel daily on County Road 512 may have to wait until February or March 2018 until the road is fixed. This new information comes from reliable sources who attended the recent committee meeting with Indian River County. Committee members in the meeting said CR-512 will be completed by the end of this month, but others say don’t count on it. When our sources asked the county about CR-512, they appeared to be confused. “What about 512? You would be amazed at how they don’t want to talk about it. They want to talk about Vero Beach and access roads to I-95,” anonymous sources who attended the meeting tell Sebastian Daily. CR-512 has become a safety issue in Sebastian, and some say it is the reason for several accidents. 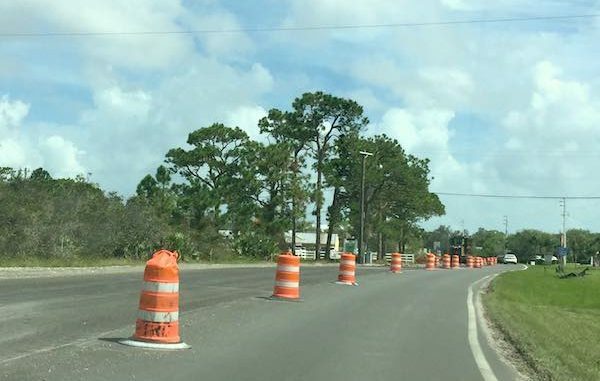 The Sebastian Police Department were told this past week that construction for CR-512 would finish by Dec. 15, 2017. However, that’s unlikely. “They shut down both sides and reduced it to single lanes. Then, they recently added pavement to one lane making it an uneven road. How much longer is this sh– going to go on,” a motorist asked Sebastian Daily. So, what’s the problem with CR-512 construction? The IRC committee which oversees this project says Hurricane Irma and rains have delayed the construction. But, Hurricane Irma was long ago, and came and went with minimal damage. Since then, the area had rain, but not enough to flood the roadway. And while the workers and their equipment can’t work in the rain, the weather has been pleasant enough for construction. Some days are overcast, but there’s been no actual rain. According to multiple sources who attended the county meeting, they’re not concerned about Sebastian. It’s all about “Vero” and their roads. Sebastian has almost twice the population than Vero Beach. Monday through Wednesday, it was sunny, great temperatures, and not one worker at the construction site. No work was done to complete CR-512. What’s wrong with working at night? A road that’s only 1/2 mile on both sides is taking forever to finish. Traffic is a headache for all motorists living in Sebastian.